Ready to experience a new twist on entertaining? Cook the Part is much more than a collection of recipes. It's an entertaining revolution. Each of the eight themed menus in this book is divided into parts. Your guests work in teams to cook a part of a fabulous four-course meal. Cook the Part helps you organize and create a memorable evening of hands-on cooking while enjoying the camaraderie of your guests for a phenomenal gourmet dinner. If you are intimidated by the thought of having a dinner party, let this book boost your confidence. Cook the Part allows anyone, even the inexperienced, to host dinner parties that will leave guests talking for months. The secret ingredient to your success is the perfect plan. Cook the Part provides detailed hosting plans that divide an entire gourmet menu into scripted parts, allowing groups of 6-12 participants enjoy the cooking process together. The menus offer a world of global flavors, such as Baja Fish Tacos, Greek Souvlaki or Tuscan Chicken Under a Brick. With this guide, even the most sophisticated dishes are broken down into manageable preparation steps, resulting in a fabulous dinner to be enjoyed with your friends, family, co-workers or gourmet group. Cook the Part provides you with a guide for a great teambuilding activity in the comfort of your own kitchen. Guests leave empowered with new recipes and cooking techniques to show off at home. The experience is fun, interactive and delicious. Karin Eastham has enjoyed cooking and entertaining with her husband, Gary, for over 40 years. The couple has participated in numerous gourmet groups and have hosted countless dinner parties. Karin's passion for cooking with her family is rooted in her German heritage. Born in Germany and immigrating to the United States in 1956, she honed her cooking skills at a young age under the watchful eye of her culinary-minded mother. Her mother's cooking and hosting skills were legendary, and Karin was frequently summoned to help when there were guests to feed. In her 30-plus years in the professional world, Karin has contributed to the success of several biotechnology and life science companies, while cooking and entertaining for weekend fun. 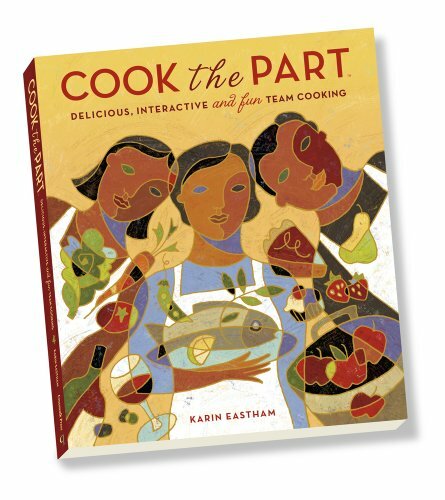 Cook The Part combines Karin's exceptional leadership and organizational skills with her love of cooking and entertaining. This perfect blend of experience in both the kitchen and the boardroom creates a unique entertaining guide to help anyone be a successful host.